With the average household carrying over $15,000 in credit card debt, credit cards can really wreak havoc on your personal finance goals if they are not handled responsibly. If you only make minimum payments, you are looking at a hefty chunk in interest payments and many years of repayment. With that being said, that does not have to be you. Below are the best ways to pay down your credit card debt and FAST! This is an obvious tip to reduce debt but only applies if you feel you can't trust yourself with a credit card. If you typically handle them responsibly, there are good reasons to keep on using them as we will touch on. You also do not want to close any credit card accounts (especially older cards with high credit limits) as this can bring down your credit score. If you are putting them away, just try and charge something small every now and then to keep the account active. If not, the credit issuer may end up closing them. Right now you are bleeding money paying interest. Take advantage of the latest credit card offers and stop paying interest right now. The longest promotional offer for a balance transfer is 21 months and you can use that to your advantage and get your credit card debt paid off, interest fee. As you know by now, making a purchase on a credit card with a balance means you pay interest starting the day you make that purchase. If you have a card that is designated for everyday purchases that you pay in full each month, you avoid interest charges and you can take those savings and pay down your other debt. Furthermore, if you have a cash back rewards card, this can sometimes be better than paying cash and you can put the rewards towards paying down your debt. 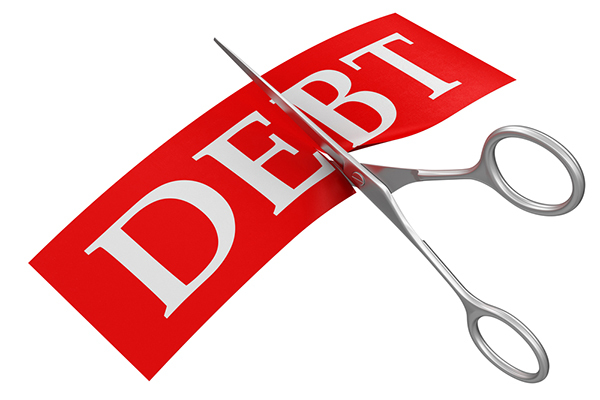 One of the best ways to pay down your debt is by going through your expenses with a fine tooth comb and cutting down as much as possible. Those savings can now go towards paying down your debt. There are many ways you can start cutting down. Everything from cancelling your cable and any other paid services, minimizing food waste, stop eating out, no more fancy coffees. As you start analyzing your finances, you will see exactly where all your cash is going and where you can cut down. There are so many ways to make an extra buck these days. Whether it is working overtime, selling unused belongings or using the many money making apps that are out there, any extra income you make can go towards your debt. Also consider putting any monetary gifts or your tax refund towards your debt. Every little bit helps and if you are creative enough, you will find lots of ways to make money. Yes it is possible to get your interest rate lowered. Just make sure you are speaking with someone who has the authority to make the change. When asking for a lower rate, be sure to make your case for how you have been a good customer and why you feel you deserve this rate change. If they approve a rate change, make sure to ask them to send you a letter of verification with the start date. Give this a try for each of your credit cards and you may be pleasantly surprised. Interest charges are usually based on you average daily balance. If you make at least two payments a month, you will lower that daily balance and pay less in interest. If you can swing making weekly payments..even better. Paying the card with the highest interest rate off first is the most efficient way to start crushing that debt. This will save you the most money on interest especially if your card also has a higher balance. Once that card is paid off, go to the card with the next highest interest rate and so on, until your cards are paid in full. If you cannot qualify for a good balance transfer offer, a consolidation loan may be the answer for your higher interest cards. With this type of loan, you are financing a larger sum to help pay off smaller loans. This really helps simplify the process since you will be paying a single lender. Getting yourself out of credit card debt is not an overnight fix. In order to be successful, you have to change the way you handle your finances and prioritize how you spend your money. Your new financial ways may take some getting used to, but the money management skills you will gain will allow you to live a financially sound life moving forward.